Gergana Dimitrova, a.k.a. BELONOGA, is best known as one of the magnificent singers from ‘Le Mystere Des Voix Bulgares’ and ‘Eva Quartet’. 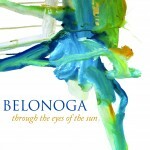 Belonoga’s deep knowledge of Bulgarian folklore and her encounters with the ancient musical cultures of Australian Aborigines and African Pygmies over the years have led to a combination of musical ideas provoked by the primordial and structured by the melodious. Thus, an extraordinary new music, extremely rich in emotions, came into being – a dialogue between the archaic culture of the Aborigines and Pygmies and the melodies of Bulgarian songs. The foundation of her work – the human voice – sought the direct connection between them in a new musical world. Belonoga has created a whole musical universe. A key role in the project was also played by Alex Nushev, who helped Belonoga to realize her ideas over years of studio work. The rest of the participants include Kostadin Genchev – one of the best Bulgarian kaval players and founder and director of the groups Bulgara and Wild River; Violeta Petkova – gadulka (rebec); Dimitar Tishev – accordion; Dimitar Hristov – tambura (pandore); and Greek multi-instrumentalist Vangelis Karipis – percussion. Special guests in the project were the magnificent Armenian singer and musician Hayg Yazdzhian (percussion, voice) and jazz doyen Anatoly Vapirov (saxophone). The project was mixed by Alex Nushev and Peter Walsh (who also worked on ‘The Arch,’ as well as with Peter Gabriel, Pulp, Stevie Wonder, and others).